If you have haven't done the Marblehead to Halifax Ocean Race (MHOR) it is well worth considering. Begun in 1905 and formalized as a biennial race in 1939, the MHOR has become a very popular North-East USA event. It is a challenging race and also offers easy access to Nova Scotia, Cape Breton and Maine - some of the best cruising around. Check out the official MHOR site for all the details. SailFast uses an "isochron" methodology to find the fastest route between any two points. An isochron is simply a locus of points showing where a boat can be at a certain time. Wind predictions and boat polars are the major inputs. When current is significant the optimum route can be meaningfully affected. A good knowledge of all three factors can give you a nice "unfair" advantage in offshore racing. 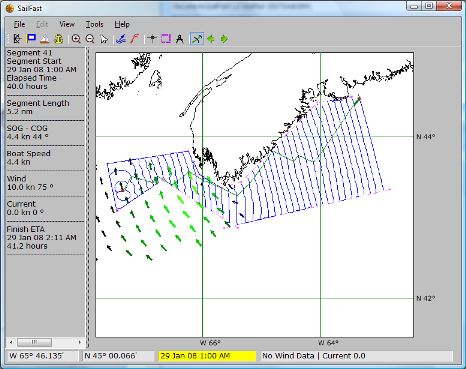 For Gulf of Maine races SailFast uses built-in tidal data. Grib files with current data are also supported, which is appropriate for other venues, such as Bermuda races through the Gulf Stream. So does current really matter? Below are a few interesting examples. Using Sailfast I set a starting position about 75 miles due West of Brazil Rock. This is above the rhumb line from the Marblehead start. Perhaps half the races in recent years have had winds that tend to put the fleet above the rhumb line. 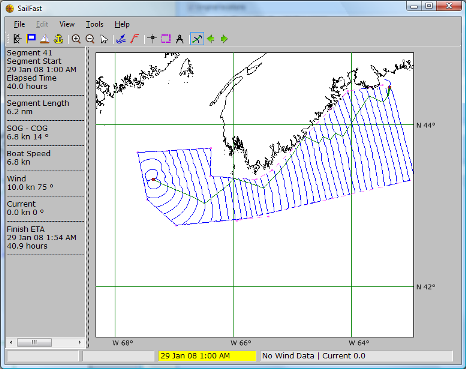 Using the What-If dialog in SailFast the wind was set to be a fixed 10 knots coming from 75 degrees true. A Grib wind forecast could have been used but this keeps the analysis simple and lets us just look at current effects. The screen shot below shows an isochron solution with a predicted ETA to the finish of 40.5 hours. This optimum course takes a long first tack below the rhumb line, then way back up before the third tack comes back down close to Brazil Rock. 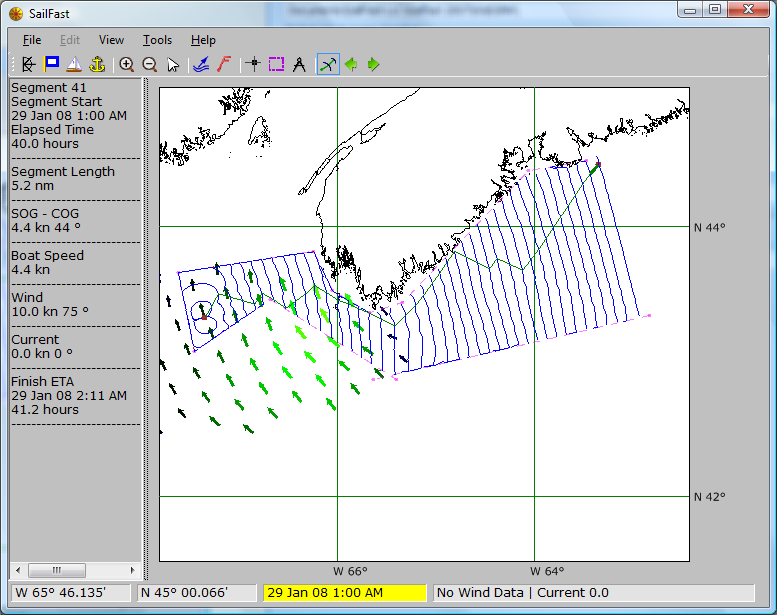 This next screen shot is the sailing solution for exactly the same conditions except that the Gulf of Maine current has been disabled in the Tools/What If/Current dialog. Normally this is done when you aren't sailing in the Gulf of Maine, but we can use it here to see the current effects. Without current the optimum track's ETA to the finish is 42.8 hours, which is 2.3 hours longer than with current. Perhaps more interesting than the time difference is the course difference, with a long first tack above the rhumb line followed by a long tack down near Brazil Rock. Let's go back to the real world case with current. What happens if we sail above the rhumb line for a while instead of sailing down on the first tack? It's not obvious from the isochrones how that will change the ETA. 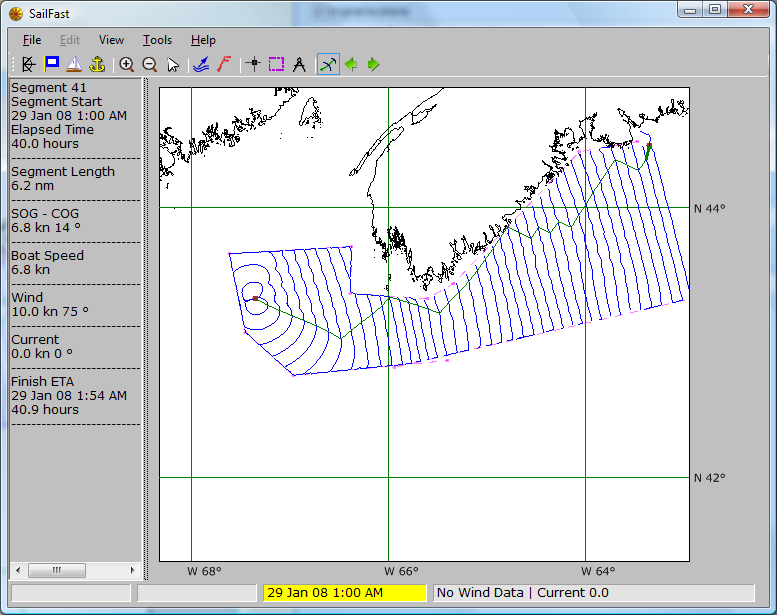 To answer this question in SailFast the sailing boundaries can be adjusted to restrict the sailing to certain areas. In the case below the lower sailing boundary has been set much higher, preventing an isochron solution below the rhumb line for half the distance to Brazil Rock. In this case the finish ETA is 41.2 hours, or 0.7 hours slower. Now let's say we are a little nervous about going well above the rhumb line and relatively close in shore before getting to Brazil Rock. We are concerned that the wind may become light and we don't like the risk. What happens to the ETA if we stay farther offshore before passing Brazil Rock? Here the top boundary line has been moved down. The finish ETA is now 40.9 hours, or 0.4 hours slower than the optimum track with no boundary constraints. With Grib wind forecasts available the analysis gets a lot more complex. Fortunately Sailfast handles the calculations easily. 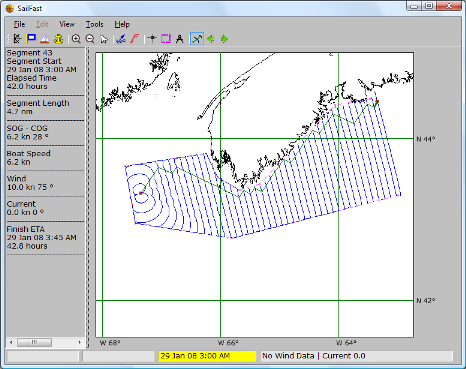 Of course the data SailFast uses is never perfect, and wind and sea have a habit of doing the unexpected. But how the navigator combines sound judgement and experience with the tools available can make all the difference. And let's not forget the importance of the sailing happening on deck. Hey - this is what makes sailing fun!